There may come a time in your life when you consider veneers or dental implants to correct some common functional or cosmetic issues with your teeth. It’s a big step to consider these options, as they are commitments that are quite permanent in nature. If braces are recommended for you, timing can be a factor. When it comes to veneers and implants, can braces be an option? Veneers are perfect for patients with discolored or damaged teeth. Constructed from thin pieces of porcelain, veneers are attached to the surface of the teeth, re-creating a healthy, natural look. They help to strengthen the enamel of the teeth, improve overall appearance and self-confidence, and are custom-made for each patient. The important thing to keep in mind with veneers is they are a commitment that is irreversible. Can I Get Braces with Veneers? Since traditional braces attach to the teeth by way of a bracket, it is recommended that any orthodontic work be done prior to getting veneers. If the bracket is attached to a veneer, there is a risk of it damaging the veneer once removed. However, there are other options besides traditional braces that can be considered. Invisalign is often recommended to patients with veneers as an alternative if orthodontic care is needed after the veneers are in place. 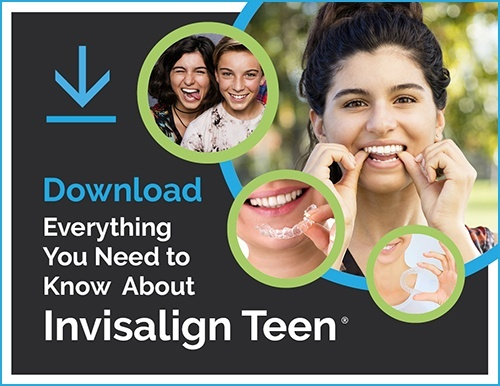 Invisalign is a clear aligner that works by gradually moving the teeth into a desired position. It is recommended to patients with veneers by certified orthodontists, since it is removable and doesn’t need to attach to the teeth to work properly. Like veneers, dental implants are typically permanent in nature, and when deciding to get braces, timing is an issue to consider. Can I Get Braces with Implants? A dental implant is surgically placed in a specific spot in the jawbone and does not include the ligaments necessary to be able to move like a regular tooth. Because of this, braces are not typically an option for patients with dental implants; however, braces can be an option for teeth that are unaffected by the implants. This means some teeth surrounding the area where an implant is in place can get braces. An orthodontist will need to evaluate the areas of the mouth that are suitable for braces and determine how to anchor the brackets to these areas. Since both of these options are permanent in nature, you see now how the timing of braces is critical. Be sure to evaluate your options and speak with your oral healthcare providers to design the best plan of action for you.